Tarja Pitkänen-Walter, Evening Chimes, 2005. 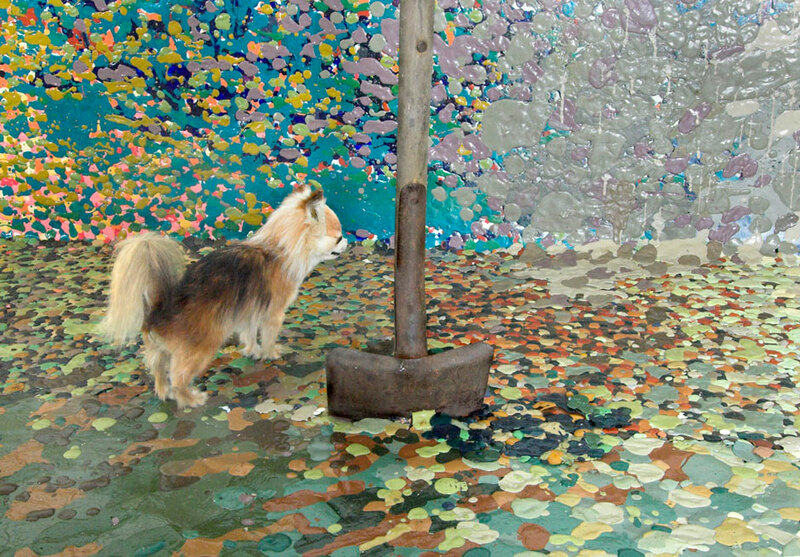 Installation: rubber-plastic painting, spade, stuffed dog, sound. Image courtesy of Jussi Vatanen. Minna Havukainen, The Final Sign in This Time, 2009. 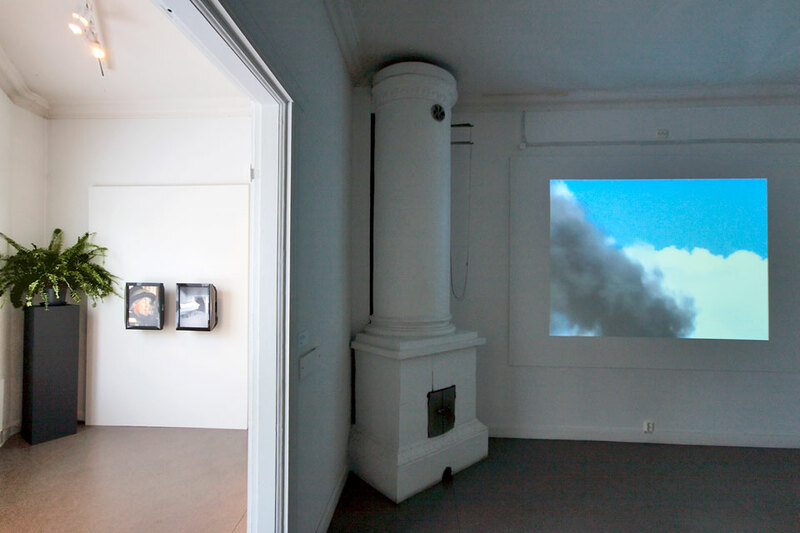 Video projection: crematorium smoke. Image courtesy of the Rauma Art Museum. Atte Uotila, Up, Up, and Away, 2008. Installation: wood, mirror, video camera, computer, monitor. Image courtesy of the Rauma Art Museum. Atte Uotila, At Grass Root Level, 2007. Installation: wood, grass, soil, gravel. Image courtesy of the Rauma Art Museum. While living in the town of Rauma, Finland last fall, I had the good fortune of meeting some amazing neighbours. Curator Henna Paunu and her husband, artist Paavo Paunu, live with their three daughters in an old house next to the Baltic Sea. For the past 11 years, Henna has curated contemporary art exhibitions for children such as “I Would Like to Be a Dog” (2007), featuring dog-related art works; “Really Neat” (2008), with a theme about cleaning, hygiene and environmental issues; “My Home is My Castle” (2010), exploring a variety of ideas about home; and “The Middle of Nowhere” (2011), which explored ideas of emptiness, eternity, wilderness, forests and death. In curating the work of contemporary Finnish artists for audiences of children and young people, Henna’s work proposes new opportunities for meaning making along with significant ruptures of art world hierarchies. Her exhibitions reconsider the constitution of “developed” and “competent” art audiences, and “provide another ontological possibility” for the ways in which contemporary art exhibitions are conceived and received. Not only does her work offer outstanding opportunities for the children of Rauma, it also imagines an expanded practice for adult artists and curators. Hannah Jickling: I’d love to hear a little bit about how you first came to curate contemporary art exhibitions for children. In your opinion, what was lacking in existing kids’ exhibitions? Is it possible that in curating these shows you were also responding to a missing element in contemporary art exhibitions that typically target adult audiences? Henna Paunu: I started creating these exhibitions because there was this tradition at the Rauma Art Museum, a once-a-year exhibition for children. It was a starting point and I had this job to do. My personal interest was in contemporary art, so I tried to combine these two things – children’s exhibitions and contemporary art. When I am making art exhibitions for children, I feel like I have a certain responsibility; I have to answer to their expectations. I feel there must be something joyful or exciting or interactive because the joyful element is quite often missing. I try to combine serious content with fun. In previous conversations you’ve talked about what is typically expected of children’s exhibitions in that they are often centered around fairy tales, teddy bears and other predictable ideas about children’s culture. So in terms of expectations and responsibilities, do you feel you need to remake other ways, other possibilities for developing children’s exhibitions? I am less concerned with past exhibition practices, and more concerned about a responsibility to the children when they come to the museum. I don’t want them to be disappointed, I want them to have a real experience of something. I want them to be curious and to get something for that curiosity. That’s the responsibility I feel toward children, I get nervous about how they will react. Actually, it is very nice to feel responsible to children and not to critics, or art specialists. How do children relate to your shows? What have you noticed in them and their experience of the museum? And what have you learned in terms of your own development as a curator? I think they have been successful for the most part. There have been some problems also, but I think that for the most part the exhibitions have been successful and the children want to come again. That is the best feedback to get, if a child wants to come back. In general children are a good audience because they are, by nature, very curious and interested in new kinds of things. I think the main thing is that curating happens in some sort of unknown area, so my choices come from an unconscious place. I work from what I feel and cannot analyze everything. I try to understand what could be interesting for children; I trust my feelings and my senses. So of course there is some sort of knowledge about what could work, or what could be suitable. I think that I feel more relaxed when I am curating for children; somehow I know them better as an audience. It is important for me to think about the audience and how it works. It seems important to you that the artists whose work you curate are making their work as usual, not knowing that it will be in a show that’s targeted for children and young people. Could you talk about that a little more? It is possible for an artist to make work specifically for children, but it is also possible for an artist to make work to be curated for children that doesn’t necessarily target only children. It doesn’t have to be “children’s music,” or “children’s art,” meaning objects created for a particular understanding of what or who a child is. It is a very important part of education for children to enjoy art and go closer to the art world. Sometimes when an artist makes something for children it can work very well, but sometimes I think it loses something; it loses the artist’s original way of working. And do you think that is because there can be some sort of prejudice on the part of artists, in terms of what they assume kids can accept as capable viewers? Work that is made for children is often something that tries to be a little bit too easy. It is very important to always have some sort of mystical element, a work that cannot be explained well. Allowing for the possibility to integrate an artist’s work in different ways should be available to children. You mean allowing possibilities for complex interpretations? Yes, and maybe because I’m making and curating very much from my own intentions I try to mediate the same kind of artworks that I have experienced myself, for children. That’s also why I am often choosing existing works and not commissioning new works from artists. Well this makes me want to go back to an earlier question. I want to know how the experience of curating for kids has affected your curatorial development in general? I think I can be more brave with my experiments, more so than with other exhibitions. I am able to experiment with how to install things and make different kinds of spaces. Seeing how audiences react within these experiments has given me more confidence and knowledge. I have also noticed that those things that work with children are often the same things that work with adults and so I have been able to try things out with other exhibitions that weren’t initially for a special audience. But maybe the main thing is that I’ve developed self-confidence. I know that somebody is appreciating my work. So it’s like a very strange relation with children, you get the feedback immediately. And you can see in the art world there are so many different kinds of truths – what is good and who is interested in what. It is a very unstable situation from which to work, as an artist and as a curator also. So for me it has been very important to get that feedback for my work, on the level that I have received it from children. I have been thinking a lot about kids as viewers and experiencers of conceptual art. It seems to me that the idea-based focus surrounding conceptual works really lends itself to children. As viewers, an immediate engagement with ideas allows them to by-pass the kinds of formal training that artists get in art school. Sometimes, they have an ability to “get it” in unexpected ways. Children often don’t have a sense of limits in the ways that adults do. Could you give an example, from your own work, about why kids are uniquely situated as receivers or producers of conceptual art? 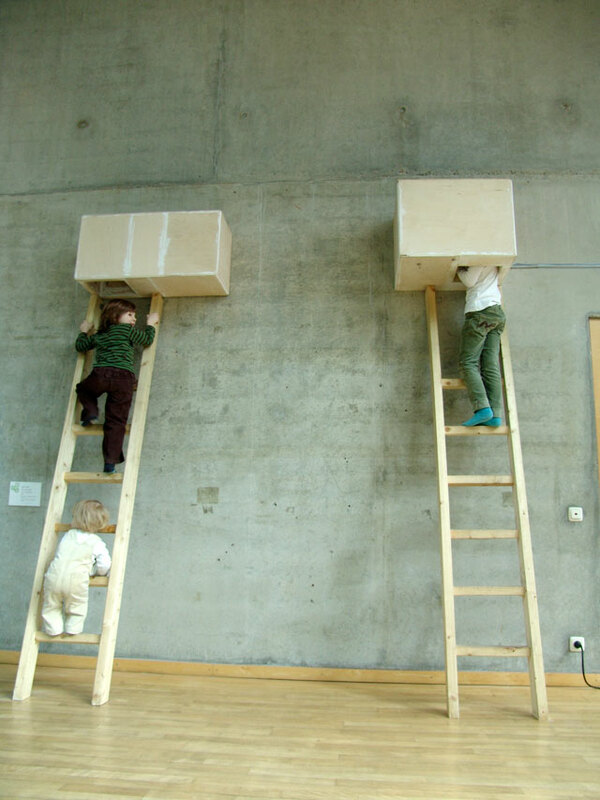 Children are not typically interested in hierarchical things in the art world. There could be a local artist who has not made any kind of career in the art world or who is not internationally known, and for children, that doesn’t mean anything. So, to answer your previous question, it relates to the kind of experiments I have been able to make. Children don’t normally care so much about the status of the artist, they can be really open to everything and therefore there is a kind of freedom in the exhibitions I am able to make. One show that I curated was in Berlin and because we got money from someone who supports numerous artist exhibitions abroad, I realized I had to consider a kind of status level, in all the artists that I was showing. In the different shows that I curate, there is an understanding of what and who is possible. I like to bend these kinds of rules. Sometimes it is very nice to work without worrying about the status of the artist or the institution. The reason that I am interested in this aspect of your work is because these questions relate to my own work as an artist who collaborates with kids. There is a prevailing, and very conservative sense, amongst many art educated adults, that in order to participate in art making, and the conversations that surround it, you have to have had some kind of training or that you have to have followed some sort of “development” that is actually very linear and prescriptive. While I value education and practice, I wonder if this sense of progression or canonization happens at the expense of insights we could be gaining from kids, and other marginalized voices for that matter. And this is where I come back to the possibilities within conceptual art, because it allows for transgressions of the learned rules. So in my mind, I am interested in thinking about an expanded sense of conceptual art. I am wondering if you could provide examples, from your own work, about why certain idea-based, process-based and research-oriented art practices are well situated to kids? I think it is that, because with conceptual artworks, there is some sort of idea behind the work and that idea can be talked about. Those discussions with children about ideas can very often be related to everyday life, and you can talk about children’s lives at the same time as the art. It can be easier with young children because they don’t necessarily have that kind of idea or question of, “Is this really art?” Or, “Is the shampoo bottle art?” Or, “Is a hanging t-shirt art?” As they get older they learn these distinctions and classifications. When they are young they are often more interested in the story and they don’t always have to know the skill behind the artwork. I also wanted to touch on something we talked about before: how art is often able to raise difficult and uncomfortable subjects. Can you give examples of successes or challenges you’ve had while broaching difficult artworks and issues with kids? So maybe the most difficult thing has been death; it is an issue that interests children very much. In one exhibition we had pictures of dead people. They had died totally naturally. They were very old and lying peacefully. But many adults were afraid of how children might react to those photos. But I think almost all the children who saw the images were really interested. They asked questions about how the people looked, how they were dressed and whether they were still growing – that kind of thing. They were really studying the images and wanted to hear about why the artist had taken those photos. We discussed all of these things including the fact that these photos had been taken in cooperation with the peoples’ relatives, that it is natural and the people were very old and that those relatives loved them and were taking care of the last things before burying them. But maybe more difficult was the exhibition with a stuffed dog? Is that it? Yeah, and for the children that was more shocking. They really needed the explanation about why there was a dog in the artwork. However, we told them the story about how the dog had died. The artist hadn’t been able to put it in a grave because it was winter and she couldn’t dig the earth, so she put it in her icebox. And then the next spring she started to plan the artwork in which she could have her dog taxidermied. Those kinds of heavy and emotional things are needed with children because they start to think and ask questions. I hope you don’t mind if I make a leap to a previous conversation in which you mentioned that kids are the most intellectual audience. Could you talk about that a little more? I think my idea of what it means to be intellectual is related to curiosity, and in being able to see things in different contexts. Children can do that in a very creative way, their presence is quite strong. In my opinion, being intellectual relates to being awake. Of course all children are different, but mostly they are curious and really want to learn new things and not hide from them. And that’s my idea of intellectuality, and maybe that is a different kind of intellectuality, an intellectuality of life. Is there something that kids enable in us that we can’t access in other ways of working? 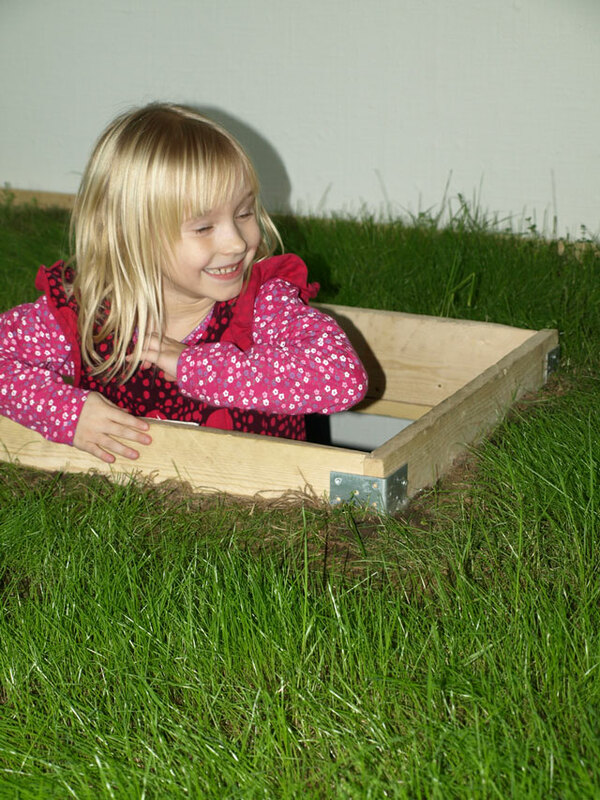 How could working with children change a contemporary art climate, if we were to think big? I have this idea for an art book where the artworks in the book are presented by children. Artists sometimes want to have very serious researchers or curators writing about their work as a way to give it value. But it could be a totally different kind of idea, that the children are the ones giving value to new conceptual art works. So maybe that should be done, to work with and to try to find those kinds of very creative attitudes from children in order to made a serious art book. I always think about this artist I know, Wendy Red Star, who taught sculpture classes at Portland State University. She was telling me that for one of her assignments, she had a child come in to critique the students’ work. I think it is very refreshing. Because so much of existing art discourse focuses on subjects and objects, it is sometimes good to have an outsider’s opinion to present ideas in a fresh way. Because many people are outsiders when looking at art. I want to keep thinking about how to continue looking at the outsiders as actual insiders. As part of the conference “It’s All Mediating,” which was held in Helsinki earlier this year, you spoke about “working with future,” could you talk about that a little bit? Making exhibitions for children in this kind of provincial art museum is a way of creating adult audiences for the future. Today the museum is trying to create relationships that will last as long as possible so that there is some sort of effect in their future. It’s the same thing as taking care of art education and also building a new audience for the future. That’s why children are the most important audience for us, we want them to get used to visiting the museum over a lifetime. You’ve talked about kids coming back to the museum after a school visit to bring their friends or their parents. And I love the idea that in many ways, contemporary art exhibitions are arriving in Rauma by way of the children. Could you talk about one of those instances that was rewarding for you? So there are lots of situations where children want to come again. They have followed the guided tour where there is somebody there to help keep the discussion going around the works. And the children invite their friends after they’ve visited with their school, so that is the next big step – they want to come voluntarily. They often start doing their own guiding and start to talk about the art with their friends and maybe with their family. Sometimes they tell their own stories – they can mix artworks and create a totally new context. I think it is most important when they bring friends and take that active role; being active is very important. Sometimes children come to the museum entrance and ask about a certain exhibition or artwork, about whether it will come to the museum again and that is so nice. I would really like to show some of these works for a second time, so maybe one day I could curate a collection of the most popular works. Now I’ve got two very good ideas, the book and the greatest hits. I have enough material for that because there have now been ten or eleven exhibitions for children. It would be fun to follow up with some of the kids who are older now and have experienced some of those exhibitions to see how they would reflect on those experiences now as way to revisit the idea of “working with future” in the present moment. I look forward to an opportunity to do this this with some of the kids I have worked with. Thanks so much for sharing all of these ideas and philosophies that surround your work and research. HENNA PAUNU (b.1968) studied art history at University of Helsinki and works as a curator and independent critic. She curated the international Rauma Biennale Balticum exhibitions 2002-2010, presenting contemporary art from the Baltic Sea area at the Rauma Art Museum, Finland. She has also curated exhibitions by young Finnish artists for the Fine Arts Association of Finland and the Paulo Foundation. Earlier, she worked as a curator at Kunsthalle Helsinki, and as producer and president in the Raumars – the international artist in residence programme in Rauma. As a curator she has a special interest in environmental art, community-based art projects and integrated pedagogy. Lately she has also been active as a member of board in the Finnish Society for Curators and Pedaali – The Finnish Association for Museum Education. HANNA JICKLING experiments with the possibilities of form, participation and meaning-making across disciplines and publics. Her projects often take shape as site-specific sculptures, public installations, events, exchanges, photographs, multiples, printed matter and other ephemera. Atypical forms of distribution, entrepreneurial scheming and audience-seeking are important strategies for supporting and disseminating her work. Hannah has recently completed artist residencies at Outdoor School (Multnomah Education Service District), The Pedagogical Impulse (University of Toronto), Becoming Pedagogical (University of British Columbia) and the Raumars Artist-in-Residence Programme (Rauma, Finland). Her work is held in private collections across North America and can be tasted in the form of sourdough pancakes, an ongoing work hosted at Bubby’s in Manhattan. She holds a BFA from the Nova Scotia College of Art and Design and an MFA from Portland State University. She frequently collaborates with Helen Reed. Heti, Sheila (2011). Darren O’Donnell. The Believer, 9 (4), 74–81. Stray Trek—On the Paths of Motion, Light and Shadow. An Exhibition of Contemporary Art for Children and Young People. Felleshus Nordic Embassies, Berlin, Germany, March 6–April 30, 2009. Minna Havukainen, The Final Sign in This Time (2009), Goodbye (2009), Exitus 13/17 (2009), Deceased 2 (2010), Exitus 1 / 17 (2010). Tarja Pitkänen-Walter, Evening Bells (2005). IAM: It’s all Mediating. An international conference on curating and education in the exhibition context. Kiasma Museum of Contemporary Art, Helsinki, Finland, May 30–31. Download The Most Intellectual Audience: Hannah Jickling interviews Henna Paunu as a PDF file.